CECOCAFEN | Small Farmers. Big Change. Interested in learning more about the producers who grow your coffee, the co-operative businesses they have created to successfully compete in the global marketplace, and the impact this work has had on their communities? You can visit some of these co-ops yourselves. Stay in the homes of the farmers. Meet their families. Learn to make tamales and tortillas. Pick coffee. Try your hand at depulping the freshly picked beans. Visit the dry mills where the coffee is processed. Hike in the forested mountains where monkeys and opossums still hang out in the trees. Visit the schools, health clinics and other community projects that Fair Trade premiums have helped support. A number of our co-operative partners have developed eco-tourism projects so that students, Fair Trade Advocates, coffee zealots, and the cross-culturally minded can visit, stay in farming communities, and learn for themselves what the buzz is all about. As someone who brings many groups to visit the producer co-ops and meet the farmers, I can tell you there’s nothing more interesting, more fun… and more life changing than the relationships that get formed when consumers take the time to meet those who produce their food – be it coffee, tea, chocolate or domestic products. You can read about Fair Trade, sustainable agriculture, and rural development all you want –but nothing takes the place of real human interactions. These eco-tourism projects offer a unique (and unfortunately, rare) opportunity to connect deeper to those whose hard work impacts our own lives so fully. Equal Exchange has been bringing visitors to one of these highly organized farmer co-ops, CECOCAFEN in Nicaragua, for over ten years. These annual delegation visits, together with our strong relationships with both CECOCAFEN and with our Interfaith partner, Lutheran World Relief, provided some of the early thinking and financial support that eventually led the co-op to develop an integrated eco-tourism project. An exciting aspect of this program is that it developed with full participation of the community: the men, women and youth were involved in its design and implementation. That’s what Angela Vendetti and her business partner, Jill Fink, heard when they started dreaming about opening Mugshots Café in Philadelphia. 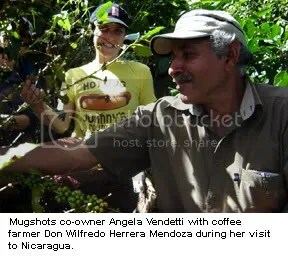 “When we were writing our business plan and trying to get Mugshots open, people told us we were crazy for putting our ideals before business sense,” Vendetti explained to John Steele in the Philadelphia Weekly‘s recent article on Mugshots. I would like to share a highly inspiring story from Nicaragua of solidarity between unemployed farm workers and a small-scale farmer co-operative that Equal Exchange has partnered with for over 15 years.